No argument that Myst is fair when it comes to allowing people to make up their own minds on Qanon and any other number of topics. I think it says something good about TBR that it isn't a main attraction, the way it is at TOS. FR Q threads run into the hundreds of posts, and that's not common for them anymore. We don't have to agree on this particular issue. Sometimes we get prickly when we don't stand in the same place regarding something (not meaning you, or even @Quix). But since none of us agree with our own spouses 100% of the time, anything else would be shocking and more than a little weird. Very fair & accurate points. Thanks. Talks about us impatient ones; Mocking bird media etc. etc. It's said there is no such thing as bad publicity, and Lord knows President Trump has proved it many times. This video clip is 6 months old but I just found it tonight. Apologies if you've already seen it. Hopefully you will find it interesting in the short time we still have before the STORM! have you read 100% of? How many of the last 100 have you read? THANKS for your candid reply. Soooooooo are you proud of forming such 'fiercely certain' convictions about Q-Anon's validity etc. 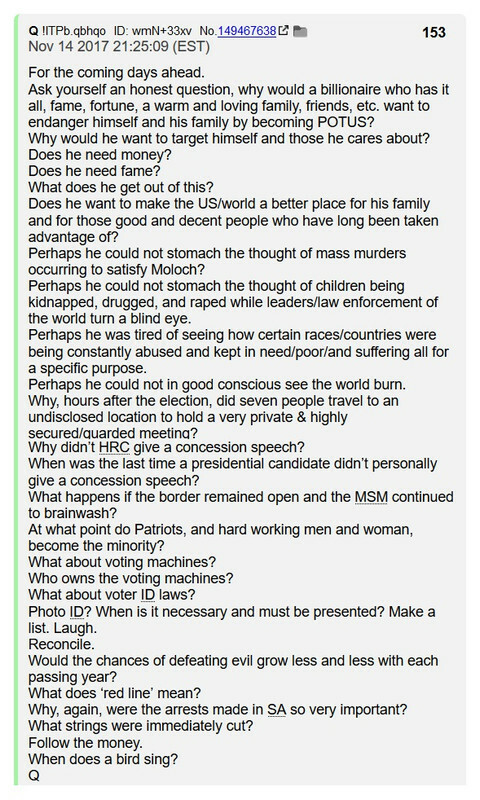 from reading part of ONE of the Q-Team's posts? Seems pretty unwise to outrageously arrogant & cheeky, to me. I've read every one of them and many 3-4 times. My IQ is extremely high. I'm pretty well read across the topics Q has to do with. Perhaps it is conceivable that I might have more insights and understanding about the Q team & their posts than those who have read little to nothing of the Q posts. It is difficult to impossible for me to imagine myself posting such hostile certainty about a source I'd only read part of one post on. I slightly belabor this because it is a very fascinating phenomenon I've seen spring up on several forums. It always boggles my mind. Mystifying. Evidently bias is an extremely powerful motivator for lots of illogical, irrational stuff. I'm sorry you took my post as hostile. While I don't believe conspiracy theory I find it interesting and I thought the clip I posted was hilarious. I was hoping you had a sense of humor. There's a Scripture about saying negative things and then claiming they are in jest or a joke. The context seemed to indicate that your perspective was in agreement with that video. I do not see the Q-team as any kind of THEORY, conspiracy or otherwise. Of course, if one is given to swallowing the MSM globalist Kool-Aid saturated swill, then everything against their narrative or telling the truth about their narrative MUST be labeled a "conspiracy theory" to try and diminish the clout the truth tends to have. Condolences when THE STORM blows the lid off your "theories" and/or your humor. Prov 26:18-19 - "Like a maniac shooting flaming arrows of death is one who deceives their neighbor and says, “I was only joking!”"
YUP. That's the one. Thanks. I'm still waiting, and I'll check you off as "no" for a sense of humor. I'd like to believe God has a sense of humor because he made me in his image, and he made others so I could laugh. Blessings. Was accused by my wife of having a dry sense of humor. My students frequently laughed in my classes very warmly. But then I don't consider infanticide dismembering just aborning children limb from limb, sacrificing them to satan and eating them something to joke about. I agree that God has a sense of humor. Sometimes it is fiercely biting and sarcastic. He mocked one hapless enemy or class of enemies (I forget) comparing them to donkey dongs. I don't recall any Scripture where He used humor about child sacrifices. About that, He had the fiercest of anger. I take it back. I thought you might be a wacked out fringe freak, but you pin-pointed my weakness for all-you-can-eat child sacrifice buffets immediately. How do you do it?!? I am ashamed. Not familiar with this gal who evidently has extensive experience in broadcast news or some such. Plausible. Don't know how likely. May be somewhat confirming of the post just below. I do NOT doubt that such research has gone on and several potent horrific germ warfare options are ready & waiting for application. However, the globalists also want to reduce ALL mankind down to 500 million globally. Yeah, genocidal eugenics is still part of their game. Perhaps it is an issue of what happens in what sequence. 2) Sometimes, Q allows you to be a fly on the wall. Without compromising operational security, you're allowed to observe, from a limited perspective, the operations happening around the globe in the takedown of corruption. We watch as various operators receive instructions from headquarters and carry out their missions. 4) With that in mind, Q posted a series of images overnight that give us a glimpse into another operation. Like past operations, this one apparently took place in China. 5) Q posted these images early this morning along with notes regarding the operation. Since this information is only for operators, Q hasn't replied to guesses about the meaning of the text that goes with the images. 6) Observant anons noted that Q posted without a tripcode. 8) Q posted a second set of pics that appear to be surveillance images taken in real time (RT) during the operation. 9) Are the targets od their vehicles shown in this image? 10) This seems to be an operation command. Pull all surveillance images taken during the last  (minutes/hours) and scan them using both wide and narrow field of view to identify any targets. Be alert next 10 days. FF attempts may be carried out in attempt to change narrative (neg optics). High possibility of ‘multiple day’ coverage event forcing pause on news. See something > Say something. Just let my daughter (school principal) know. Page created in 1.448 seconds with 22 queries.